Open to Public Event dates and ticket information can be found HERE. 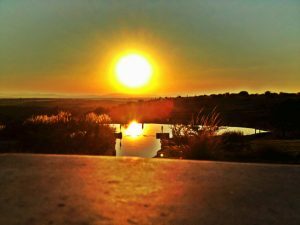 We are perched on a hill just 15 minutes outside San Miguel overlooking the Laja Valley and we have some spectacular sunsets so we usually start our events before sunset and go on until well into the evening. 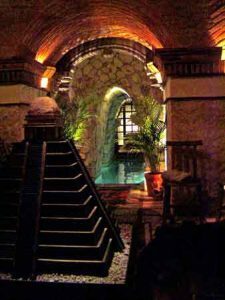 Guests arrive to the underground lounge and bathrooms and once changed proceed to the Topo Loco Bar to sign in and from there to the pyramid chamber to relax by the waters subterranean entrance while listening to an eclectic mix of music that is softly piped throughout. The facilities are all mostly underground and the pyramid is a heater which allows for perfect climate control all year round, day and night and in any kind of weather. 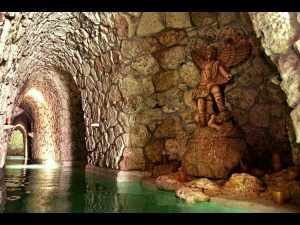 From the pyramid room you enter the thermal waters into a quartz/crystal tunnel that leads to an inside cave with a water cascade of 101 degree mineral water or to the outside pool where you watch the sunset and later the clear San Miguel night sky. The tunnels and cave are lined with over 100 candles and Mayan symbology is found throughout the underground passages and tunnels. 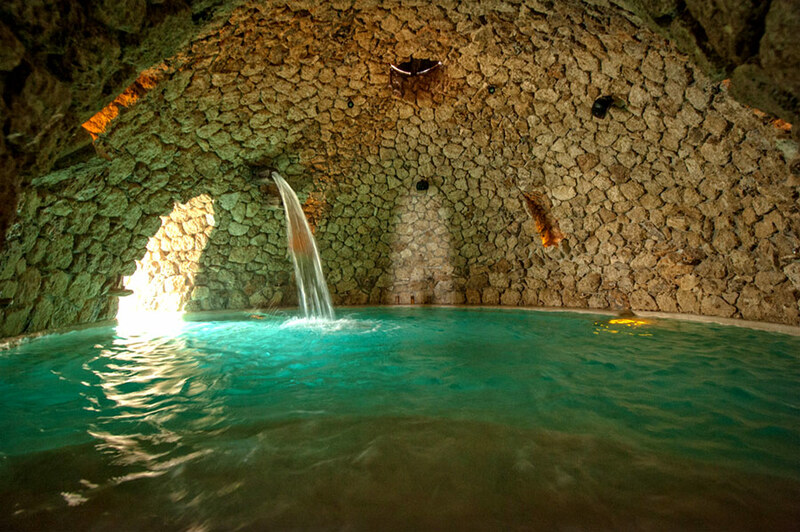 Although we have two private areas for massages we are not actually yet a hot spring spa but more of a “Roman Baths” with subterranean thermal water filled caves and tunnels. 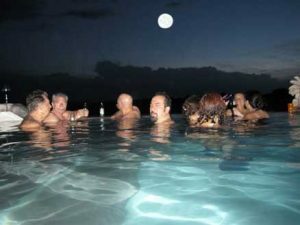 Dozens of couples have proposed marriage in the romantic setting of the Mayan Baths upper jacuzzi which we decorate with floating rose peddles and clusters of candles. Among other special events we had a private underground concert by the popular Mexican recording artist, Franco and Hacienda Arcángel has hosted several charity fund raising events. Most notably the grounds were donated for a Maria Muldaur “Roots Concert” for the benefit of the local library which drew 750 people. So if you are planning a Birthday, Anniversary, Wedding Event or just a get together with friends, we are at your service for Private events. Scheduled open-to-public events are available to adults and grown children. Private events are open to anyone. If you were looking for the information regarding the sale of Hacienda Arcangel / The Mayan Baths & Spa project, please CLICK HERE to go to the sales web site for this property.